The Yield is a once-in-a-generation reinterpretation of the oeuvre of Franz Kafka. At the same time, it is a powerful new entry in the debates about the supposed secularity of the modern age. Kafka is one of the most admired writers of the last century, but this book presents us with a Kafka few will recognize. It does so through a fine-grained analysis of the three hundred “thoughts” the writer penned near the end of World War I, when he had just been diagnosed with tuberculosis. Since they were discovered after Kafka’s death, the meaning of the so-called “Zürau aphorisms” has been open to debate. Paul North’s elucidation of what amounts to Kafka’s only theoretical work shows them to contain solutions to problems Europe has faced throughout modernity. Kafka offers responses to phenomena of violence, discrimination, political repression, misunderstanding, ethnic hatred, fantasies of technological progress, and the subjugation of the worker, among other problems. Reflecting on secular modernity and the theological ideas that continue to determine it, he critiques the ideas of sin, suffering, the messiah, paradise, truth, the power of art, good will, and knowledge. Kafka’s controversial alternative to the bad state of affairs in his day? Rather than fight it, give in. 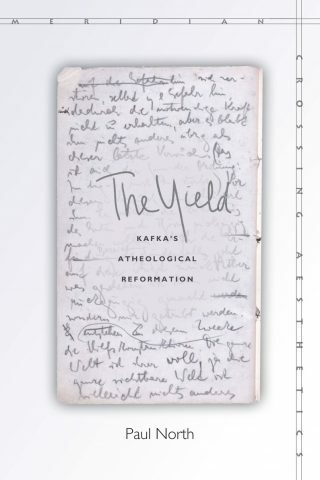 Developing some of Kafka’s arguments, The Yield describes the ways that Kafka envisions we can be good by “yielding” to our situation instead of striving for something better. Paul North is Professor of German at Yale University and author of The Problem of Distraction (Stanford, 2012). Let us notify you when this symposium starts!